I have been away from the blogosphere. I haven’t read or posted anything in almost 3 weeks. What can I say…as much as I want to take every second person’s advice and blog often and in between, it just doesn’t seem to happen. The thing is, I have been busy. Sometimes, the work piles up, the commitments cannot be broken and the flu descends. Yup, that’s the kinda busy I was. And being in such a state, I was feeling quite lethargic and insipid; every time I opened the page to post, I just couldn’t start or finish a sentence. Blogger’s block! Ivy gourd. I don’t know how popular it is in other parts of the world, but here in India, ivy gourd or kovakkai has been on my family’s dining table since forever. They are small, green and elongated; and look kind of like mini-watermelons. 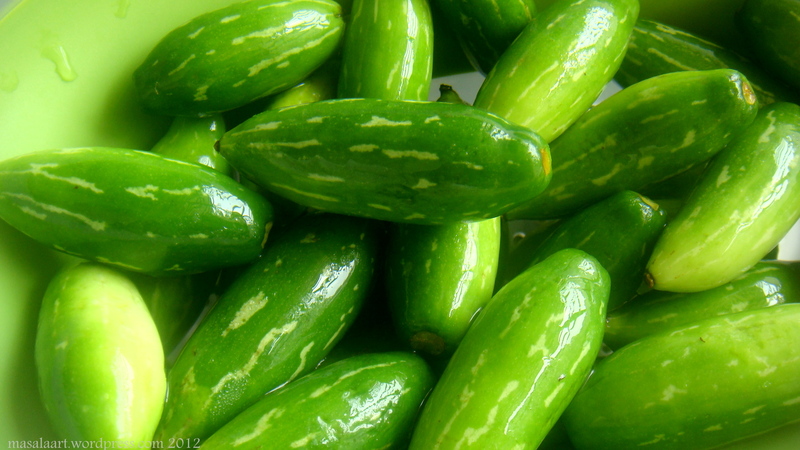 Texture-wise, they are like taut cucumbers, crisp and crunchy, and the skin isn’t so bitter that you need to remove it. 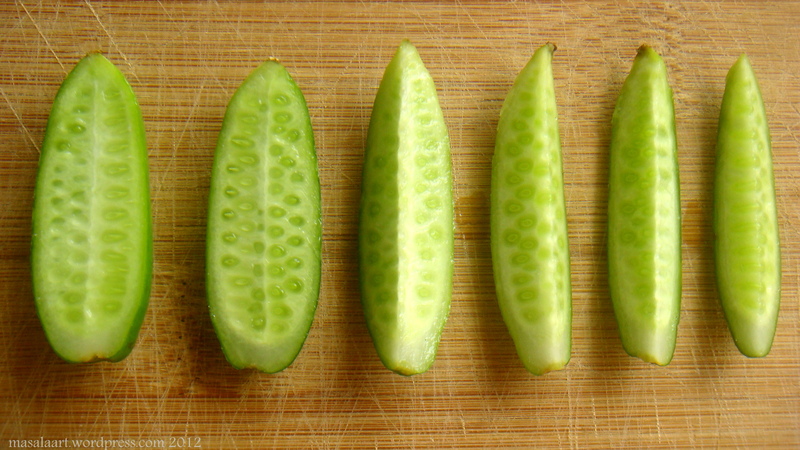 The insides look like this- quite like a cucumber, just smaller and with less water content. 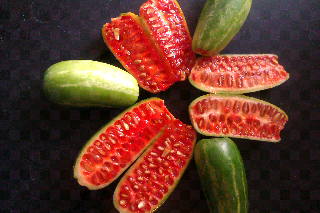 However, when ivy gourds get very ripe, the insides get soft and turn a brilliant pink; like pomegranate seeds. So very pretty to look at, but not as fun to cook with. One of the first things I remember hearing about this humble vegetable is, ‘ivy gourd is good for diabetics.’ My great-grandmom was diabetic, and she was made to eat a few raw ivy gourds each day, since it was supposed to help regulate blood sugar levels. (She rarely did; she just moved them around on her plate, ignored them completely or hid them under a poppadum. Benefits of being 80+!) But from the little bits of information I’ve read, it is the leaves and not the fruit that do the trick. Anyway, this is just me waxing eloquent because I can and because I want to drag this post on as long as possible without having to share a recipe. Ivy gourd is eaten in India usually in curries, or cooked as a dry sabzi or thoran; I however like it in its natural form and eat it as a salad. Which I will share with you tomorrow because it’s almost midnight now. Here’s to more regular posting! « Paneer Butter Masala: Classic. Glad to see you back 🙂 Know how busy it can get only too well, hope your flu’s gone now too! I’ve never heard of these though – love the way they change colour! Ivy gourd is kundru, right? I hate it! My grandmom would force it down my throat when I visited her every summer. Just can’t stand the suckers now. But I guess I should give them another shot. Ugggh I am the same with the regular posting. How do people do that, if you have to juggle house, work, kids, homework, extra curricular activities? I could, I should and I must. Never happens. I learned that gherkin/pickle is the same as Kovakkai, only a western version. I tried pickling a few Kovakkais just to experiment. And your post reminded me that I should check it! Oh so they all hail from the same family! Kovakkai pickles sound good- look forward to hearing how yours turn out! I love the pink insides! You wouldn’t expect it to look like that on the inside, so it’s a nice surprise! Kovakya fry is a family favourite here. Looking fwd to the next post M! Kovakya rocks!! I once had this version with crushed peanuts and jaggery, it was really good! Hey reading comments like these make me so happy! And also encourage me to post more often. I’ve never seen ivy gourd!! It’s pretty cute. Like a tiny fancy cucumber. Hey!!! I moved my hosting! Soooo I’m still at the same address http://www.sugardishme.com/ but my posts won’t appear in your wp.com reader anymore. If you haven’t already, you can re-subscribe via email or rss feed. And tell your friends! And blog more when you have a minute (that wasn’t a guilt trip or anything). Oh!! What’s the update on the meanie mom from your building?